Well it is now 3:00 am in Istanbul, Turkey, and despite the exhausting trip getting here, jet lag has gotten the best of me. Since I seem to be reviewing the day’s events in my head anyway, I deemed this as good a time as any to blog about my day. So, how was the trip getting here? Long, but uneventful. After an on time departure from Dulles Airport in D.C., we arrived in Munich at 8:00 am their time. I had time for a walk to stretch my legs, and a nap- stretched across several chairs- before the final flight to Istanbul. Two an a half hours, and a surprisingly delicious in-flight meal later and I had arrived. We landed, I passed through customs after purchasing a $20 visa, collected my bag, and made my way to the tourist office. There I got my hands on a map and instructions for the metro system. At the ticket machines I made my first friend. A “Maree from Australia” who had also just arrived, though she’s spent the last nine months backpacking around Europe. These spunky Australian girls are a travel staple. No matter where you go, you’ll find these spirited girls, laden down with packs as big as they are, and bursting with knowledge, stories, and a sense of adventure. Maree lent me 2 Turkish Lira after the machine repeatedly rejected my 10 Lira bill, and shared a portion of the train ride with me. Before she had to get off, to transfer to another line, we exchanged e-mails and Facebook information. Hopefully we can meet up again and do some of the touristy exploring together! A few minutes later the train came to my stop as well, and with simple map in hand I began the search for the flat I would be staying in. About twenty minutes and 5 stops for directions later and I was sitting cozily in the living room of Erdi’s flat. Erdi is a young Kurdish man who has lived in Istanbul for five years, slowly studying economics and making the rent by subletting rooms to travelers and doing free-lance computer repair. We spent the rest of the evening chatting over tea. We ordered in for dinner, and upon Erdi’s recommendations I had some spicy kebab, something that sounded like “ichili kutte”- a fried meatball squirted with lemon juice, and a salty yogurt drink, typical from this area. 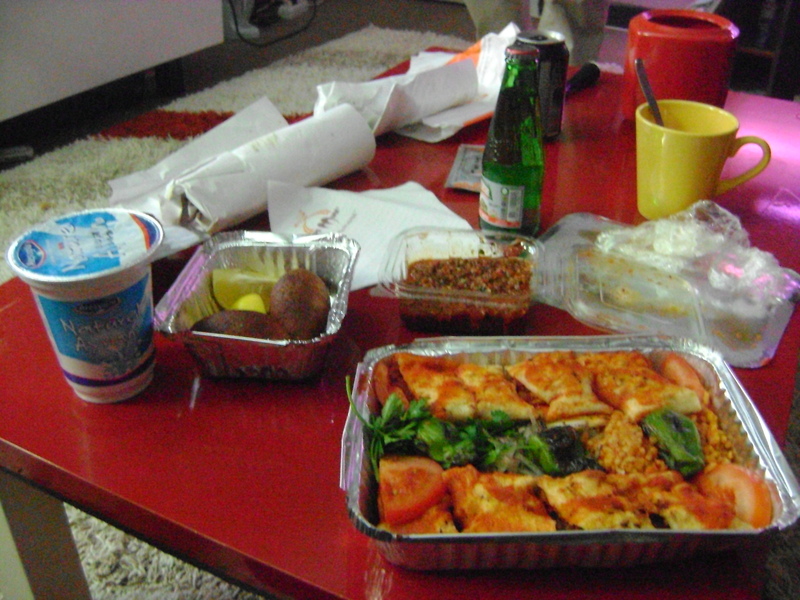 It was all delicious, and I had it all for 16 Turkish Lira. Spicy Kebab, Fried Meatball, and a Salty Yogurt Drink. All delicious! After the food, the warmth, and the friendship I was quite content and relaxed. My exhaustion quickly caught up with me, and shortly afterward I excused myself to retire for the night. After all, tomorrow I had a busy day of learning about my new neighborhood! I did not spend any money as most of that day was spent on the plane. – TOTAL: $31.07, well under budget for the day. I’m off to a good start! We’ll see how it goes tomorrow, when I start my first full day in Turkey. You organize the blogs very well. For example, I like how you start out with a short summary of what the blog will be about, and then you recap it at the end. In between, you put the key points in boldface. These are small touches, but they work well, and I’d bet there are lots of disorganized travel blogs out there. I like your idea of traveling within a budget, and how you describe your haggling. Those are critical for people who have never been to a particular foreign country — you can save a ton of money, as you know. I don’t really have any criticisms for now, as I’ve just started reading and I like everything I see. Looking forward to reading the next entry. Be safe over there so we can get dinner when you’re back here!